The year to date numbers are even worse than the year over year numbers. With consumer spending accounting for 70% of our GDP and real inflation running north of 5%, it’s pretty clear most Americans are experiencing a recession, despite the propaganda data circulated by the government and Fed. The only people not experiencing a recession are corporate executives enriching themselves through stock buybacks, Wall Street bankers using free Fed Bucks while rigging the the markets in their favor, politicians and government bureaucrats reaping their bribes from billionaire oligarchs, and the media toadies who dispense the Deep State approved propaganda to keep the ignorant masses dazed, confused, and endlessly distracted by Cecil the Lion, Bruce/Caitlyn Jenner, Ferguson, and blood coming out of whatever. You won’t hear CNBC, Bloomberg, the Wall Street Journal or any corporate mainstream media outlet reference the fact retail sales growth is at the exact same levels as when recession hit in 2008 and 2001. Their job is to regurgitate the message of economic recovery and confidence in the future, despite overwhelming evidence to the contrary. 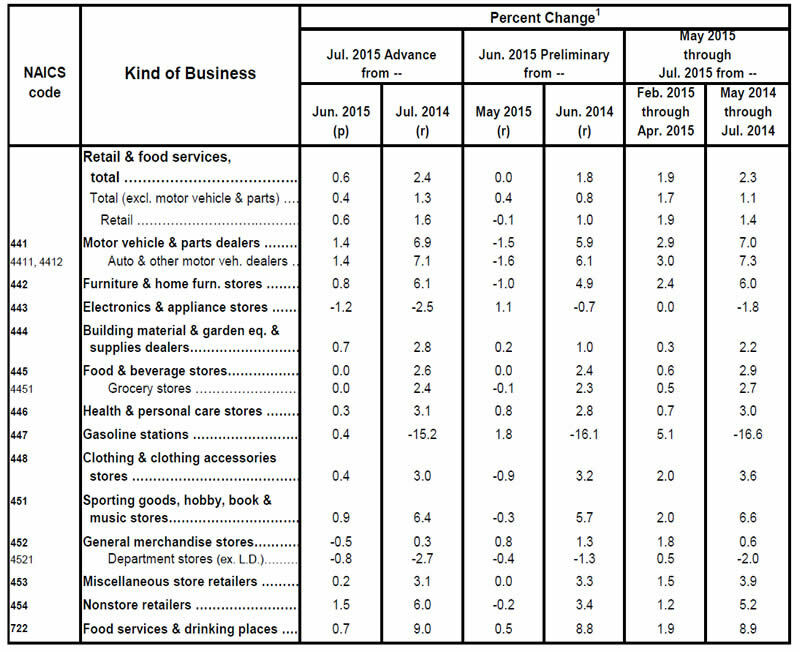 Retail sales are actually far worse than the 2.4% reported number. Excluding the subprime debt fueled auto sales, retail sales only grew by 1.3% in the last year. The automakers are practically giving vehicles away as their lots are stuffed with inventory. The length of auto loans and the average amount of auto loans are now at all-time highs. The percentage of subprime auto loans is surging to record levels, as defaults begin to rise. The percentage of vehicles being leased is also at an all-time high. To call these “auto sales” strains credibility. These people are either perpetually renting their vehicles or just driving them until the repo man shows up. The relatively strong year over year furniture sales is also driven by the fact that you can finance the purchase at 0% interest for seven years. All is well for the Ally Financial, GE Capital and the myriad of fly by night subprime lenders until the recession arrives, unemployment soars, and defaults skyrocket. Then their bloated debt ridden balance sheets will explode in an avalanche of defaults. That’s when they insist on another taxpayer bailout to “save the financial system”. The year over year crash in oil prices was supposed to result in a huge spending splurge by the masses, according to the media talking heads. You don’t hear much about that storyline anymore. The talking heads are now worried that oil prices are too low. I guess the tens of thousands of layoffs in the oil industry and the obliteration of the Wall Street financed shale oil fraud storyline is offsetting the $10 per week in gasoline savings for the average driver. At least restaurant and bar sales remain strong. It seems Americans have decided to eat, drink and be merry, for tomorrow they die. I do believe there is some truth to that saying in today’s world. I think people are drowning their sorrows by drinking and eating. They’ve drastically reduced buying stuff they don’t need with money they don’t have. Spending their gas savings at a restaurant or bar is still doable. With real median household income at 1989 levels, real unemployment north of 15%, a massive level of under-employment, young people unable to buy a home – saddled with $1 trillion of student loan debt, middle aged parents struggling to take care of their aging parents and struggling children, and Boomers who never saved for their retirement, the mood of the country is decidedly dark and getting darker by the day. The rise of Trump and Sanders in the polls is an indication of this dissatisfaction with the existing social order. The part of the retail report flashing red is the sales of General Merchandise stores, and particularly department stores. This category includes the likes of Wal-Mart, Target, Costco, Sears, Macy’s, Kohls, and JC Penney. General merchandise sales fell 0.5% in July, with Department store sales dropping by 0.8%. Sales at these behemoth retailers have barely budged in the last year, with overall sales up a dreadful 0.3%. The dying department stores have seen their sales plummet by 2.7%. The talk of a retail revival is dead on arrival. Wal-Mart and Target muddle on with lackluster results, while JC Penney and Sears continue their Bataan Death March towards the retail graveyard. The false narrative of economic recovery can be blown to smithereens by the historical data on the Census Bureau website. Their time series data goes back to 1992. GDP has supposedly risen by 22% since 2007. General merchandise sales were $48.4 billion in July 2007. They were $56.1 billion in July 2015. That’s a 15.9% increase in eight years. Even the manipulated and massaged BLS CPI figure has increased 14.5% over this same time frame. That means that REAL retail sales at the nation’s biggest retailers has been virtually flat for the last eight years. Does that happen during an economic recovery? The department store data is almost beyond comprehension. July department store sales were the lowest in the history of the data series. Sales of $13.8 billion were 22% below the July 2007 level of $17.6 billion. They were 28% below the peak level of $19.2 billion in 1999. Real department store sales are 36.5% BELOW where they were in 2007, and Wall Street shysters have had buy ratings on these stocks the whole way down. These worthless hucksters remove the buy rating the day before these dinosaur department stores declare bankruptcy. Excluding the debt driven auto sales, real retail sales are flat with 2008 levels. The data from the Census Bureau has been more than confirmed by the absolutely atrocious financial results reported by Macy’s, Kohls, Sears and J.C. Penney. Retailers do not report results this poor during economic recoveries. The results clearly point to an ongoing recession for the middle and lower classes who do the majority of working and spending in this country. The rich continue to spend their stock market winnings at exclusive boutiques and high end retailers like Nordstrom, but the average American is being sucked into the abyss by rising food prices, rent, home prices, tuition, and the Obamacare driven health insurance and medical costs. With declining real wages, they have less and less disposable income to spend buying cheap Chinese crap at their local mall department stores. Overall sales fell 2.6%, while comparable store sales fell by 2.1%, as Macy’s continues to close under-performing stores. News flash: there are many more stores to close. Profits crashed by 25.7% as gross margins declined and expenses rose. Cash flow from operations has declined by a staggering 46% in the first six months of this year. The bozos running this sinking retailer have mind bogglingly burned through $787 million of cash, while adding $452 million in long term debt to buyback their own stock. Executive compensation is stock based, so wasting close to $1.6 billion in the last year as sales and profits fall, is considered prudent management by the CEO. Despite falling sales, the management of this sinking ship have increased inventory by $200 million in the last year. This bodes well for margins in the second half of the year. The long-term future for this retailer gets bleaker by the day as their long-term debt, pension liabilities, and other long term obligations total $10.4 billion, while their declining stockholder’s equity totals $4.8 billion. To show you how far Macy’s has come in the last nine years you just need to compare their results from the 2nd quarter of 2006 to today. They registered sales of $6.0 billion versus $6.1 billion today. On a real, inflation adjusted basis, their sales have fallen by 16% over the nine year period. They had profits of $317 million in 2006, 46% more than the $217 million in the 2nd quarter of 2015. They had $13.6 billion of equity and $8.2 billion of long-term debt. And now for the best part. Despite generating 46% less income than they did 9 years ago, Macy’s stock sits at $63 per share, while it traded at $36 per share in 2006. A company with declining revenue, declining profits and a bleak future should not be sporting a PE ratio of 16. When this recession really takes hold, their 2009 price level of $9 per share will be challenged on its way to Radio Shack land – $0 per share. Overall sales were up a pathetic 0.6% after last year’s 2nd quarter sales were lower than 2013. Comp store sales were up only 0.1% after being down 1.3% the previous year. Profits fell precipitously by a mere 44% versus the prior year, down by $102 million. Margins fell while expenses rose. In the lemming like behavior of corporate CEOs across the land, this struggling retailer thought it was a brilliant idea to go $330 billion further into debt, while buying back $543 million of stock in the first six months. While sales are essentially flat, the executives of this company ratcheted up their inventory levels by 9% in the last year. Flat sales growth and surging inventory levels leads to plunging margins and profits. I guess that’s why I got a 30% off everything coupon in the mail last week. Cash from operations has crashed by 52% in the first six months. You would think prudent executives would be using a half a billion of cash to buy stock and boost their compensation packages. Another comparison to yesteryear provides some perspective on how well Kohl’s is performing. During the 2nd quarter of 2007 they generated $3.6 billion of sales and $269 million of profits. Their overall sales are up 19% (3% on a real basis) even though they have increased their store base by 38%. Profits in 2015 were 52% lower than 2007. Sales per store is 14% lower today than it was in 2007. And even more worrisome for their long term survival, inventory levels are up 59% compared to the 19% increase in sales. Again, the stock price peaked in 2007 at $76 and earlier this year reached a new all-time high of $79. Despite deteriorating financial conditions, poor management, plunging cash levels, and nothing on the horizon to portend a turnaround, the stock trades at a PE ratio of 13. Sears hasn’t reported their 2nd quarter results yet, but pre-announced that same store sales crashed by 10.6% versus last year. They are truly dead retailer walking, as Eddie Lampert’s real estate maneuvers attempt to hide the coming bankruptcy from unsuspecting investors is nothing but smoke and mirrors perpetuated by Eddie and his Wall Street shyster bankers. Excluding his desperate real estate schemes, they will lose another $300 million. In the last four years, during an economic recovery, Sears has seen their sales crater from $43 billion to $31 billion, and still falling. They have managed to lose $7.4 billion in just over four years and their stock still trades at $25 per share – proving there is a sucker born every minute. They continue to close hundreds of stores and still can’t stop the hemorrhaging. The decade of using financial gimmicks rather than investing in his stores is coming home to roost for Eddie “the next Warren Buffett” Lampert. Of course, he will arrange matters in a way where he wins, while the stockholders lose when the bankruptcy papers are filed. The balance sheet is a disaster. They have generated a Negative cash flow from operations of $1.4 billion in the last twelve months. They have burned through $556 million of cash. They have $8.4 billion of long-term debt and other liabilities, with equity of NEGATIVE $1.2 billion. Sears may be the worst run business in America, and its chances of going bankrupt are 100%, but the Wall Street hype machine has its stock price at $25 per share, 20% higher than it was in late 2008. For some perspective, Sears’ 2nd quarter 2008 revenues totaled $11.8 billion and they made a $65 million profit. Sales in the 2nd quarter of 2015 will be approximately $6 billion with a loss of at least $300 million. Of course their stock should be higher. I found it humorous to see the Wall Street hucksters and their mainstream media mouthpieces cheering on the J.C. Penney 2nd quarter results as “better than expected” and proof they have turned the corner. Their overall sales went up by 2.7% and comp store sales went up by 4.1%, as they continue to close stores. For some perspective on this tremendous sales gain to $2.9 billion, their sales in the 2nd quarter of 2009 were $3.9 billion. When your sales are still 26% below where they were six years ago, maybe you shouldn’t be crowing too much. It seems Wall Street and the MSM didn’t really want to focus on the only thing that matters – profits. They lost another $138 million and have racked up $305 million of losses so far this year. They have lost money for 13 consecutive quarters. That is no easy feat. They have managed to lose $3.6 billion in the last four and a half years, while driving their annual sales from $18 billion to $12 billion. Their balance sheet isn’t as horrific as Sears’, but it is nothing to write home about. They have $6.2 billion of long-term debt and other liabilities, supported by a mere $1.6 billion of equity. Back in 2011 they had $5.5 billion of equity to support $4.9 billion of long term liabilities. The deterioration of this once proud retailer is clear to anyone with two eyes and a brain. So that eliminates all CNBC pundits and guests. Wall Street pumped the stock 5% higher on Friday to celebrate their $138 million loss. A company that is on track to lose $500 million has seen its stock price rise 32% this year on hopes and dreams. Wall Street has had buy ratings on this stock from its peak of $82 per share in 2007 on its 90% downward path to its current price. I’m sure they’re right this time. The truly disturbing revelation from the Census Bureau data and the terrible financial results being reported by some of the biggest retailers in the world is that it is occurring with unemployment at 5.3%, the economy in the sixth year of a recovery, and a Fed who has pumped $3 trillion into the banking system while still keeping interest rates at 0%. What happens when we roll back into the next official recession, unemployment soars, and consumers really stop spending? What is revealed when you look under the hood of this economic recovery is that it is a complete and utter fraud. The recovery is nothing but smoke and mirrors, buoyed by subprime auto debt, really subprime student loan debt, corporate stock buybacks, and Fed financed bubbles in stocks, real estate, and bonds. The four retailers listed above are nothing but zombies, kept alive by the Fed’s ZIRP and QE, as they stumble towards their ultimate deaths. The coming recession will be the knife through their skulls, putting them out of their misery.